I have a few things to post today and you don't want to miss out on any of it so be sure to read through the whole post! 1st, I have to share a website I recently found. **ENABLER ALERT** That's right - if you're like me, you'll visit this site and find yourself hooked! This little Easter cutie was created by cutting the card with a scalloped oval nestie that I set off the folded edge a bit so it kept part of the card together at the fold. I then created the background by adding strips of various ribbons that slightly overlap each other, working from the top and the bottom edges to the center. I added some pale pink sparkles to the scallops and then added the adorable Easter Anya to the card front with foam tape. She was, of course, all colored with Copics and Diamond Stickles were added to her eggs and ears. This Anya is a digi image from TGF. These are so inexpansive and fun to work with - just print and color! Last but not least, the winner for the month of March in the So Sketchy Sundays is Carla Harrah - congratulations!!!! I will get in touch with you (or you drop me an email) and I will mail out your blog candy prize! There's more goodies for April so keep playing every week with the So Sketchy Sundays! And watch for a bigger blog candy opportunity soon as I approach my 10,000th visitor to my blog! I love this card! It is so cute and I can't believe I WON! I'm jumping up and down right now! WAHOOO! Can't wait to hear from you! 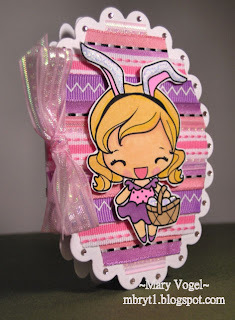 Love the card shape, it really matches the Easter theme. Great card. The image is so cute. Thanks for the tip on the site. I think this could be trouble. I love the anya with the bunny ears! And your card just SCREAMS Easter...........congrats! Lovely. I love the frogs! So very Cute! Oh this is just adorable! Love the oval shape and cute image! What a cute idea, I've never made an oval card. And your coloring is fabulous in the image. Very nice job! This card is just adorable! I have never made a nontraditional shape before! I think I need to get on it! Just beautiful! This is an adorable Easter card. I just love the Anya images (don't have any yet, but I keep seeing all of the cute things everyone's doing with them.) My hubby's not certain abt the enabling thing ;), though. This card is so fun! Great colors, shape...image.